Before I started graduate school, I worked at an artisan bakery here in Philly called Le Bus. It was definitely the best job I’ve had – or at least the one I enjoyed the most. Every day the kneaders would line both sides of a very long table, working their magic on the dough. They were mostly Haitian and I would listen to their melodic creole, watching their hands dance in rhythm. They loved teaching me how to shape the various loaves, and I still remember the softness of their perfect round boules. This recipe is a very simple take on sourdough, using only 3 ingredients: water, flour and yeast. I’ve obviously had to omit the salt, which provides most of the flavor, so this will be a much blander bread than commercial sourdoughs. 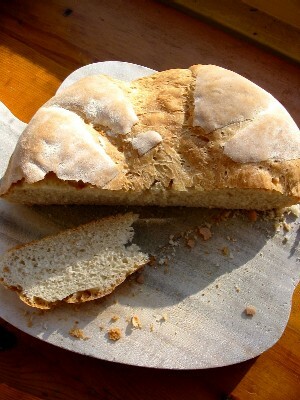 It is however a wonderfully crusty loaf, great with butter or olive oil, and a perfect accompaniment to winter soups and stews. To make the starter, measure yeast into a clean mixing bowl. Add water (make sure water is warm NOT hot – it’s better if it’s just about lukewarm) and stir to mix. Whisk in flour. Cover and leave in a warm place for 4 days. After the 4 days have passed, make the dough. Measure the flour into a clean mixing bowl. Add the water (remember lukewarm is good, hot will kill the yeast) and sourdough starter. Stir until a thick dough forms. Turn the dough out onto a clean, lightly floured surface and knead until smooth and elastic, about 10 minutes. Butter a large bowl and place dough inside. Cover bowl (I use plastic wrap with a rubber band to keep it snuggly in place), place in a warm spot and allow dough to rise until doubled in size, about 2 hours. Once dough has risen, punch it down and turn bowl out onto a clean lightly floured surface. Knead dough for 6 minutes, then shape into a round loaf. Butter a baking sheet and gently place dough on top. Place in a warm spot and allow to rise again until doubled in size, about 1 1/2 hours. Preheat oven to 400 degrees. Lightly dust the top of the boule with flour and then score an X on top of the loaf with a sharp knife. Place on middle rack in oven and bake 30 minutes. Remove from oven. Bread is done if you hear a hollow noise when you tap on bottom of the loaf. NOTE: The sourdough starter can be reused – simply add a handful of flour to the mixture after use and stir to combine. Can be left out for several days or refrigerated for about a week. If it’s been refrigerated, it must be brought back to room temp before use. Hi Elena, Last I checked TJs was still making and selling their whole wheat sodium free bread, but I haven’t bought it myself in quite some time. I’d ask your family to check availability at their local store. Hope this helps! Thanks for the tips, Sandy! Hope you’re enjoying your new Trader Joe’s now! !